At the beginning of last week I spent a few days across in Torridon for 1:1 guiding on Beinn Alligin and Slioch. Here is a quick post about what we did. Rosalind and I met at the Torridon Inn early on Monday morning and then headed round the bay to the Coire Mhic Nobuil car park where we made a start on Beinn Alligin. The hills was clear and the conditions were looking promising after a fairly dreich morning but the wind was light so we did not linger on the lower slopes to avoid being eaten alive by the midges! We chatted and climbed steadily and before we knew it, we were on the summit of the day’s first Munro, Tom na Gruagaich. The views around the reminder of the horseshoe were tremendous and out west the Isle of Skye and Outer Hebrides were as clear as I’ve ever seen. The descent from the first summit is steep so we took our time picking the best line down to the next bealach. We stopped at a minor top around 850m on the way round for a well earned lunch break before tackling the final steep climb past the impressive Eag Dubh onto the main summit and the day’s second Munro, Sgurr Mhor. From here we had a decision to make as to whether to continue round the ridge over the ‘Horns of Alligin’ or return by our uphill route. With the weather still looking fair and feeling good about our progress so far we decided to head on round. It was a quick, steep descent down to the bealach below Na Rathanan, the first of the horns with great views over to the likes of Baosbheinn. From here on we passed a few groups going in both directions and it was definitely the busiest time on the hill. As we made our ascent up the to the first of the Horns a shower came through and we made a good decision to put on full waterproofs as the rain seemed to get stuck over Beinn Alligin for the next hour or so. The traverse of the horns involves some interesting scrambling steps but despite the damp conditions we made good progress over the first two before deciding to bypass the last. Once the rain had stopped we made one final snack stop. The views as the rain cleared were very atmospheric and Beinn Dearg made several appearances before disappearing again into a sea of mist. As we commenced the steep descent down to the valley we soon came back out into the sunshine and picked up the path back to the car. This path is in really good condition and it allowed us an easy finish to the day while taking in the views of the beautiful sequence of waterfalls along the Abhainn Coire Mhic Nobuill. We were back in just over seven hours. A very successful day on the hill! 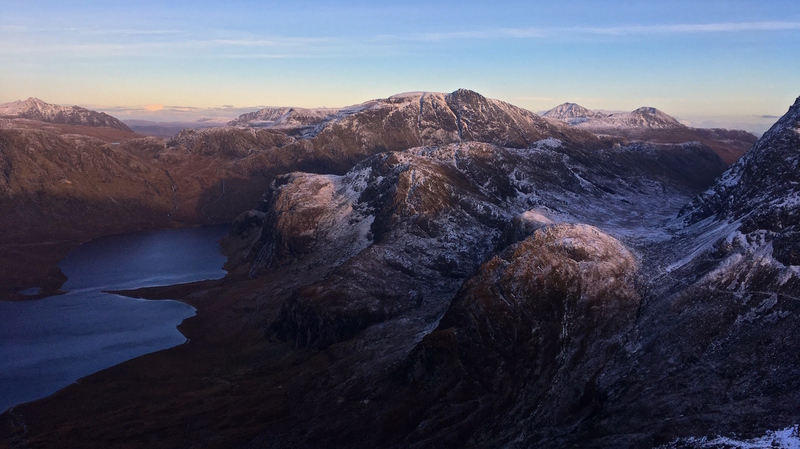 We made an earlier start for a longer day on Slioch on Wednesday morning. We met at Kinlochewe, parked at Incheril and set off on the scenic walk-in along the Kinlochewe River. It was another perfectly calm morning and the midges were out in force so again we chatted and kept walking. When we got to Loch Maree the reflections on the water were immaculate but something to enjoy on the move. After crossing the bridge at the foot of Gleann Bianasdail we turned up toward the hill. We took a line quite close to the river to enjoy some of the spectacular falls in the river before branching off from the glen to pick up the main path heading more steeply uphill. It was a warm morning and we soon made a stop for something to drink but again the midges drove us onward. Our route took us into the hidden corner of Coire na Sleaghaich from where we climbed up onto the south-east ridge of Slioch. We gained the ridge by a small lochan where we made another stop. It was a perfect spot with crystal clear water, views to distant peaks and there was not a sound to be heard. A couple of wild goats were grazing on the other side of the water. A steep climb from here took us onto the flatter upper part of the hill where the views became very extensive and we passed a very large herd of goats (I counted around 40). It was only a short stroll over to the summit where we stopped for lunch with a view out over the Fisherfield wilderness. Here I found the only litter of the trip, the cork from a bottle of Prosecco. Evidence of a last Munro celebration maybe!? Eventually we dragged ourselves away from the summit and traversed the narrow ridge out to the subsidiary top of Sgurr an Tuill Bhain, which potentially offers an even better panorama than the summit itself. By this point it was clear that a change in the weather was on its way with cloud building from the south-west so despite the temptation to linger we descended the steep ground back down to the coire floor and headed back across to pick up our uphill route. By the time we were back down by Loch Maree a bit more of a breeze had picked up and the midges were not an issue on the way back. It is a challenging walk out through high bracken back to Kinlochewe at the end of a long hill day but we made steady progress and got back to the car in perfect time just before the rain set in, ending a super couple of days in the Torridon area in great company!